We’ve been prepping a year’s worth of projects for an upcoming collaboration (we’re so excited to share it with you, but it will be a few more weeks!) so we have been thinking way ahead about each holiday. With all of this pre-planning we’ve found ourselves inundated with Valentine’s Day inspiration, so we hope you don’t mind we’ll be sharing a few this month! Today’s combines are two favorite ways of decorating: family pictures and festive garlands! Smooch Strands! 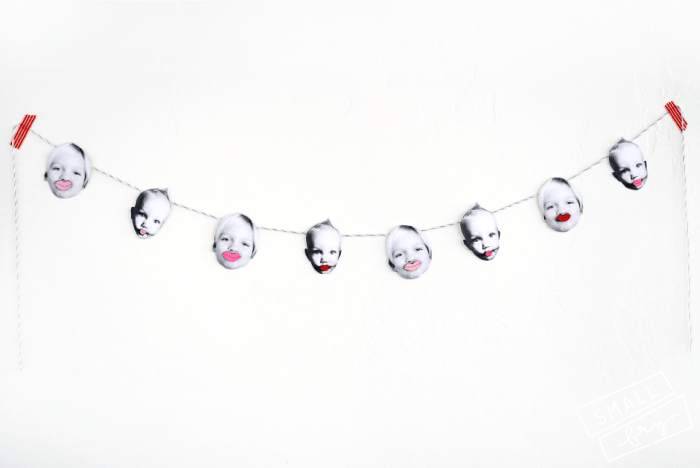 Portraits of your loved ones with an oversized kisser to adorn your wall. 1. Start by collecting portraits of your loved ones, pets, celebrity crushes, whoever you’d like to see pucker up! Emily used iPhone photos and turned them black and white for a more clean look. You can go oversized or fit the whole strand, 8 to a page, like we’ve done here. 2. Using precision scissors, cut out the head shape. 3. Once you have all the cut out heads, you’ll need a thick material (we used craft foam), glue, shades of pink and red paper and a black ink pen or marker. 4. Hand draw the lip shapes, we went oversized, and then cut them out leaving the black lines. Then glue it to a smaller piece of craft foam. Then glue the foam and lips to the face portrait! We can think of a million things to do with these little portraits so instead of sewing them onto a garland, we just taped them to the twine so we can reuse later! Tape up and you’re ready for a little lip action! Need more V-day? Check out these heart shaped tie-dye leggings DIY, or these love day lunch sack printables! Find all our Valentine’s Posts here. We like to tease Emily for using Picasa, but it’s a really simple way to collage photos. For those of you who don’t have access to Adobe or other photo programs, here’s how you can do it in Google’s Picasa for an 8 image to 1 page garland like this! COLLAGE IT: *Put the desired photos on your desktop. Open Picasa and then the “Desktop” folder in the left column list of folders. Since we only used two different photos, we needed to make copies of them to fill the page. *Right click the desired photo in Picasa and click on “Copy Full Path, copying Hayes’ photo three times and Cal’s three times. *Then in your Desktop folder, hold shift to select all the photos you want included. Once all 8 photos are selected click on “Collage” on the bottom icon tray. *In the collage tab you’ll then create the sheet. CREATE THE SHEET: Starting at the top, change “Picture Pile” to “Grid” in the drop-down. Then choose the page format drop-down and select 8.5×11. Then unclick the “Draw Shadows” box. Then click “Create Collage” and save it to your desktop. You can either print the page yourself, or send it to your favorite print shop to save ink. What a fun idea! I can’t wait to try it out. hahaha this so awesome!! I love it! I saw this project on your Instagram… It’s adorable! I made an attempt to make this with the students in my class, but it was a definite fail! Better luck next year!